at big front door in san diego, our catering service offers everything from gourmet deli sandwiches to full meals, sides, salads and desserts for any size gathering. we offer pick-up, delivery, and can even serve at your event. contact us today for more information at (619) 255-4100.
questions about catering? contact us. make your next big event in san diego one to remember with catering by big front door. our delicious catering service allows you to please the masses by bringing big front door’s scrumptious sandwiches, meals, salads, sides and desserts to your next big event. we offer affordable options for events of all sizes, including catering for breweries as a pop-up food vendor. either pick up the food, have it delivered, or we will come serve the food for you at your event. if you have not tried a big front door salad, you are missing out. we have truly turned an assortment of vegetables with a dressing into an art form, consistently creating salads that are renowned throughout all of san diego. big front door now offers our famous salads as part of our catering package for events in san diego. our bowls of salad feed 8-10 people and are sure to be a hit no matter what the event. big front door also offers full dinner plates as part of our catering services. 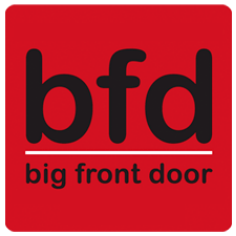 whether you are hosting a dinner party, a big event, or just a dinner for a hungry family, bfd has got you covered. we offer full meals ready to go for a minimum of 6 people. choose from a turkey breast dinner, baby back bbq ribs or a roasted salmon for an elegant and delicious meal. we also offer delicious a la carte offerings of turkey, pork, salmon, macaroni and cheese, green beans and more. no good meal is complete without sides and dessert. sure, the main course is always the delicious centerpiece of every meal, but that doesn’t make the supporting cast any less important. bfd offers sides like quinoa, beans, potato salad and macaroni salad and delicious desserts such as our delectable cookies or chocolate bombs. if you are more into finger food, we offer fruit platters, cheese platters, smoked salmon or a vegetable platter. don’t forget the drinks! big front door offers a great selection of beverages as part of our catering packages. choose from a selection of craft beer, artisanal wines, house-brewed iced tea, craft soda, traditional soda and sparkling water. make sure your guests don’t go home thirsty. big front door offers a few options for how to get the food to your party or event. you can come to one of our locations in either university heights or solana beach to pick up your tantalizing array of treats, or we can deliver it right to your location. another option is for food service from bfd. we will come to your event and serve your guests, so you can just relax and enjoy the party. big front door is ready to make your next event a smash hit! if you are interested in having big front door cater an event, give us a call at (619) 255-4100.
orders must be in by 7:30pm for next day delivery or pick-up. we do prefer 24 hour notice for all catering deliveries to insure availability and coordinate preferred delivery time. delivery is available for orders of $100.00 or more. there is no minimum dollar amount for pick-up orders. a delivery fee of $15.00 is added to all orders that are delivered. delivery person may assist with set up and placement of food at time of delivery. gratuity is not included, but greatly appreciated. house accounts are available for frequent customers. please contact bfd for more information. 12 hour cancellation notice is required. late cancellations will be charged in full (product only, no tax or delivery fee).